Ever since I heard about this book I knew that I needed to read it. Another book by Maggie? Yes please! There's something about her writing that makes the world around me disappear and nothing else matters other than reading her book. I stayed up late at night thinking about The Raven Boys and I don't think its going to leave my thoughts for quite some time. The way this book is written is just...magical (I can't think of any other word to describe it at the moment). I loved every single part of the book. The magic and mysteriousness it was just so wonderful. I've read her Wolves of Mercy Falls series, The Scorpio Races, and Lament but I think that this book is her best yet. All the characters were great. I loved each of them for different reasons but I think my favorites were Ronan, Noah, and Gansey. At one point I almost started crying because of a vision that Blue was having about Gansey. And even though Gansey is supposed to die soon I can't help but try to think of ways that will allow him to live. 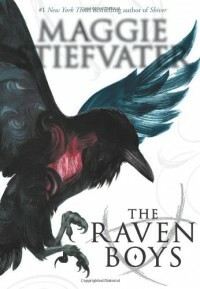 Each character had so many layers and I loved the complex relationships between the raven boys. It just added to the story. I'd never heard of the ley line before this and now I really want to know more about it and about Gansey's search. I especially want to know more about Noah's situation and that raven that Ronan named Chainsaw. That ending left me a little confused about her. The only part that might bother some people was the lack of romance. That didn't really bother me but people looking for romance should probably skip this book. I think that if you expect it then you will be disappointed. After all if Blue kisses her true love he'll die so she couldn't exactly kiss anyone. The wait for the next book is already way too long.